Many of the recordings on That's Why We're Marching were made on acetate discs with glass bases. Aluminum bases were uncommon during World War II, because the metal was put to the war effort. Songwriter and labor organizer Joe Hill wrote, "A pamphlet is never read more than once, but a song is learned by heart and repeated over and over." Topical songs, employing well-known melodies and simple messages, have traditionally been used in the USA to transmit news and to garner support for a cause. 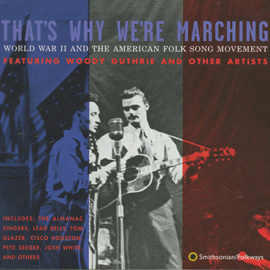 That's Why We're Marching provides a brief catalogue of topical songs in the USA during World War II performed by artists such as Woody Guthrie, Lead Belly, Pete Seeger, and Cisco Houston all of whom would go on to become legends of the Folk Song Revival. Earlier recordings of the era, in line with the government's long-held isolationist foreign policy, expressed anti-war and pacifist sentiments. After the Japanese bombing of Pearl Harbor, however, singers and songwriters quickly rallied around the flag. This burst of nationalism can also be viewed as a response of socialist songwriters to the German attack on the Soviet Union. Regardless of the motivations behind the music, many folk songs of the World War II era evoke a sense of jingoism. Josh White's "Freedom Road" reveals the strong pro-democracy emotions many folk singers felt about the war. The lyrics of this up-tempo march are by African American playwright Langston Hughes. Championing democracy abroad, "Freedom Road" also calls for Americans to abolish undemocratic Jim Crow laws at home. "What Are We Waiting On?," by Woody Guthrie, looks at the home front as well. His musical adaptation of "John Henry" suggests that labor unions would help defeat America's fascist enemies. Also included is "Round and Round Hitler's Grave" by the Almanac Singers featuring Pete Seeger. This previously unreleased recording is short, to the point, and the most popular of the Almanac Singers' anti-Hitler songs. The songwriters on this album look to the past, continuing the tradition of American topical songs, while representing the future of the Folk Song Revival. Dr. Guy Logsdon and archivist Jeff Place note, "The songs on this recording have a particular importance because they mark the meeting and creative interaction of a generation of musicians (and their recording company) that would have a strong influence on American music." This interaction was fostered by the founder of Folkways Records, Moses Asch, who kept his recording studio open to artists in and around New York during the 1940s. Many of the tracks on That's Why We're Marching are previously unreleased, as Smithsonian archivists only recently rediscovered the songs in Asch's collection of 5,000 master recording discs. Place writes, "They [the original recordings] represent a vibrant era in the New York folk music scene and the strong feelings of its participants during the war years." The artists featured on That's Why We're Marching are as fascinating as the era they lived in. They went on to become leaders of the Folk Song Revival and stood up to unfair and corrupt policies within the USA government. When the recordings on this disc were made, however, the artists solidly supported the USA and its troops in the fight against fascism some of them even joined the armed services. Many of the issues they sang about and struggled with are again relevant today.